M/V “Sherice M” with Felix Wiberg (age 6) in the foreground. The mailboat serves Cat Cay and Bimini. Her captain is Capt. Shawn Munroe who told me that the boat has been in service since 1995 and that another skipper or co-owner is Capt. Emmett Munroe. This photo is taken looking west from the southeastern end of Potter’s Cay. MAILBOAT NAME: M/V Sherice M.
BAHAMAS CAREER: Serves Cat Cay & Bimini, plus (reportedly) Salt Pond, Deadman’s Cay and Seymours, Long Island from Nassau leaving Nassau on Mondays at 5 PM and Seymours on Thursdays at 11 AM. The trip takes 15 hours and costs $45 according to http://www.bahamasguru.com/travel/mailboat.php, however the boat was not sailing the last week of March, 2014. All was calm at sea. The Grandmaster mailboat eased across a turquoise ocean so flawlessly translucent that it exposed shallow undersea sandbanks – and offered scant concealment to a passing stingray. Later, when my cabin became unbearably stifling I stargazed on deck, peering upwards at a luminously bright Big Dipper. Such was my DIY cruise, as I rode the network of mailboats plying the 700 Bahamian islands and cays. This chain of coral atolls, which won independence from Britain in 1976, begins 50 miles off the Florida seaboard and flows south-east along the northern coast of Cuba. There are around 15 government-subsidised mailboats, and they are the islands’ lifeblood, delivering post and vital cargo to these communities. All are privately owned but have government contracts for weekly mail deliveries. 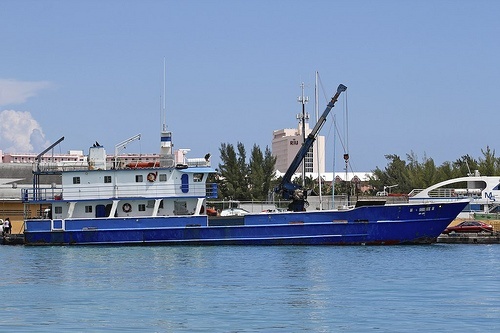 Few ferries operate in the Bahamas, with most tourists relying on short air transfers. Happily, the mailboats take paying passengers; I hoped that by climbing aboard I’d discover the cultural underbelly beneath images of resorts, casinos and cruise-liners. The vagaries of mailboats’ schedules do, however, make using them a logistical challenge. Departure information is scarce, and I discovered that timings can alter with the first sea breeze. Neither do they link multiple islands together, or spend long enough at their final destinations for sightseeing. My first port-of-call was the westernmost outpost, the Bimini Islands, which can be reached by a new super-fast casino cruise-ship operated by Resorts World. It runs scheduled services from Miami to its holiday resort, but independent travellers can also make the three-hour crossing from $99. Once there, I downsized my aspirations to the royal-blue Sherice M mailboat, a steel-hulled 126ft vessel smothered in quayside cargo as her forward-deck crane off-loaded essentials supplies from food to engine-parts. More exotic produce – frozen lobsters, potted palms – were loaded on board, for her weekly voyage back to Nassau. Before departing, there was time to explore North Bimini’s flat, beach-fringed island, described by local tourism officer Renee Robbins as “nine miles long, with 10 churches and scarcely the width of a football field”. Ernest Hemmingway came here regularly in the 1930s, indulging his passion for game fishing. Little of Hemmingway remains, because the Compleat Angler Hotel, at which he stayed, burnt down in 2006 along with much memorabilia. However, 81-year-old islander Ansil Saunders, who crafts exquisite oak bone-fishing boats, recalls tales of Hemmingway’s derring-do. Saunders also recalled ferrying Martin Luther-King Jnr around when he visited in 1968, shortly before his assassination. “He made me feel I was in the presence of angels,” Saunders sighed. Once several cars and a speedboat had been jammed on to Sherice M’s forward deck, we set sail for Nassau, 130 miles east. My ticket cost $65, for which I was allocated a bunk in a cramped cabin and a cooked meal. I shared with “Smith”, Bimini’s immigration officer, a colossus of a man travelling with his cargo of furnishings who seemed perplexed about why I was bothering with a 13-hour journey when I could fly. Necessity may have made him immune to the romantic allure of slow, sea travel, but I was soon entranced, as the sunset painted the sides of our vessel a burnt-orange. Twelve miles from Nassau, we called in at the private residential island of Cat Cay to offload cargo. I disembarked to buy a cold Kalik beer from a local store, which also sold imported French champagne. “You need $25m in your bank account to qualify for residency here,” scoffed Smith. Ours proved to be a ponderous 21-hour journey south, crossing the Tropic of Cancer, as the captain sought shelter from choppy seas by navigating the remarkable Great Bahama Bank, an immense sandbank. At one point, mid-ocean, the seabed was just 3.5ft below our keel. Large orange starfish were visible on the bottom. Fate had dealt me a kind hand. Long Island, 160 nautical miles from Nassau, is a pretty coral ribbon of continuous sandy beaches with a welcoming 3,000-strong community strung along its 80-miles. An enthusiastic crowd greeted us, part of the excited atmosphere that formed whenever a mailboat was due. At Simms Wharf, Ms Oreme, the schoolteacher, waited for the school uniforms she’d ordered from Nassau, while sponge fisherman Mandie Constantitis, a second-generation Greek, used the mailboat to export his harvest. Island Link, however, wasn’t hanging around, so I jumped ship and booked a cheap Bahamasair flight online back to Nassau the next day. This bought me enough time to hike to Long Island’s wild northern cape, to the monument to Columbus’s passage, and to swim above the world’s deepest blue hole at Dean’s, where the turquoise ocean disappears down a vertical cave into an abyss. I spent the night at Long Island Breeze, on Salt Pond wharf, where British-born former America’s Cup yachtsman Michael Mcknought-Smith offers comfortable lodgings inside a lovely lemon-yellow colonial-style house from just $75 per night. Cheap accommodation is available across the Bahamas for island-hoppers, despite it being known as a pricey destination. Even the smallest islands have B&Bs catering for the local market or for passing yachties. Nowhere I stayed cost more than $125 per night for a double. The majority of the mailboat services run on weekdays, so I had the weekends to play with during my 16-day trip. Bahamas Ferries offers a few routes closer to Nassau for those preferring shorter sea journeys. Three-hours east of Nassau is Northern Eleuthera’s popular Harbour Island. Here, 19th-century wooden cottages, painted in an array of colours and built by loyalists fleeing the American Revolution, line the western seafront. The island’s Pink Sands beach is touted as one of the Caribbean’s finest, and is apparently popular with celebrities. “Lenny Kravitz and Mick Jagger often drop by to chill. And Naomi’s here all the time,” boasted “Hitler”, owner of Harbour Island’s Vic-Hum nightclub. “And look,” added Hitler, pointing to a picture of Jack Nicklaus’s yacht. “You should see it. Like a goddam palace.” I was naturally curious as to how Hitler had got his name. “I’m kind of direct; I get things done,” he barked. I spent a weekend’s shore-leave on Nassau, getting under the skin of the Georgian-era capital away from the commercialised waterfront where cruise-ship passengers are bombarded with pirate paraphernalia, cigars and tax-free goods. Alanna Rodgers’ food-tasting tour offered a mouth-watering way to discover Bahamian cuisine through restaurant tastings: from The Pepperpot Grill’s spicy jerk chicken to divinely-rich Key-lime flavoured homemade truffles at the Graycliff Hotel’s chocolaterie. “The one thing islanders actually agree upon is how good our food is,” she told me. Meanwhile, the Bahamas Tourist Board runs a “People to People” cultural exchange programme, which allowed me to join an evening dinner party at musician Patricia Bazard’s house. One guest, a hotelier called Julius Chisholm, recalled how he’d received post via mailboats in the 1950s. “I remember it used to arrive monthly,” he said. “The whole town would turn out. If it came on a Sunday, even church was cancelled”. The Grandmaster departed Potter’s Cay the following Tuesday on its weekly trip to George Town. Owner Lennie Brozozog welcomed me aboard. His boat business had been in the family for several generations and his son, Lance, was skippering that day. Lance revealed his experience of piloting Jack Sparrow’s Black Pearl on the location scenes for the filming of Pirates of the Caribbean. From George Town, the next morning I joined a speedboat excursion to retrace what I’d missed overnight. “Welcome to the playground of the rich and famous,” exclaimed the skipper, and as if on cue, not long after passing Nicholas Cage’s private island, celebrity magician David Copperfield zipped by on his launch. Mailboat Captain Sean Munroe has noted steady growth in business recently as Bahamians, though still pinching pennies, make more use of available payment options to transport goods – and themselves – throughout the islands. It’s a pattern the Sherice M. captain particularly noticed in the last several months. And that’s where the mailboats come in. The freight boats, which travel inter-island with supplies essential to everyday life on the Family Islands, have seen a boost in its revenue streams due to the hard times. For Munroe, it’s been an increase in passengers opting to forego the pricier air ticket price for the longer – and less comfortable – boat ride. Though it may be more of hassle, for many Bahamians residing on the smaller islands, the long voyage is simply easier on their wallets. “To send a package on mailboat, it’s like $5, some airlines it’s $15,” he explained. “The mailboat gives consumers an option to save a few more dollars. . . it always has been and always will be the cheapest form of transportation. This optimism and uptick in business comes even as hard times strike boaters. Rising fuel costs, coupled with stagnant and outdated government subsidies and limits on the charges they can levy for their services, were making it unprofitable for most of the operators to continue service. The situation sparked many of the boaters to stop taking freight in May for a brief period as issues were sorted out over the redress of fuel costs, government subsidies and the levies they could charge. Many of the workers in the sector argued they could not continue operating in that environment. Munroe said gas prices are still a major issue for mail boat operators. “The only problem with the mailboat industry right now is the rising cost in fuel,” he explained. “We are formerly owned and operated, so our operating costs are far much cheaper than other companies because we can operate our own vessels at a lower cost.